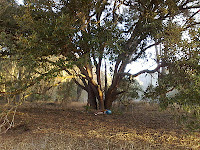 Sleeping bag: I had posted that question on another outdoor forum and was told by multiple comments that a 40 F or 32 F bag would be sufficient for Florida. Luckily I did not listen to that advice!!!! I brought my 20 F Western Mountaineering Ultralite bag and really needed it. Some nights I was still feeling cold in it - despite wearing all my clothes. This was an exceptionally cold year, but I would definitely recommend a 20 F bag. Shelter: I had considered buying a hammock for this trip, but ended up bringing my Tarptent Contrail. Neither of those two options is perfect for the FT. 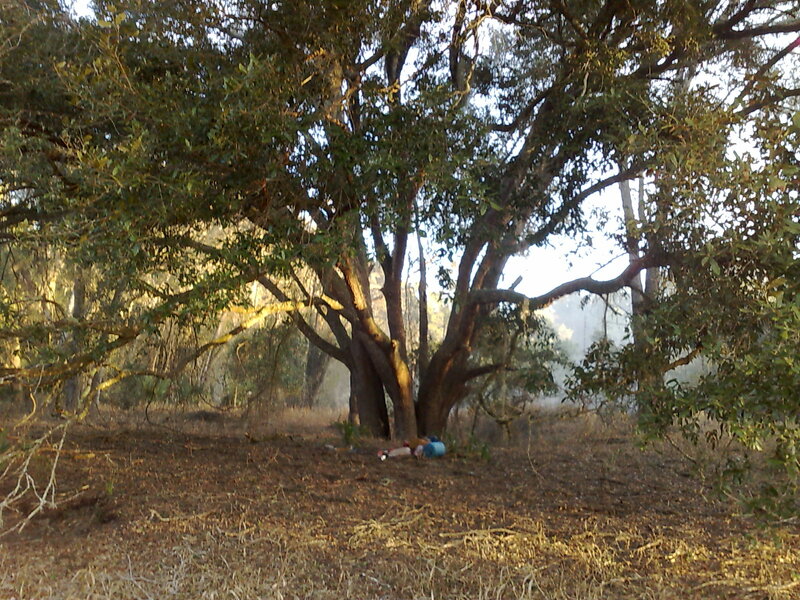 Forget about a hammock: There are a lot of stretches on the FT where there are no or only tiny trees. The Contrail is a non-freestanding tent which is not ideal for Florida. Very often there was no or very little shelter from the wind. Very often you have sandy ground and your tent stakes will come out. You can manage with a non-freestanding tent, but I would recommend a freestanding one. Shoes: I wore what I always wear: Keen trail runners and it worked great. Forget about Sealskins or waterproof shoes. You will have wet feet no matter what - so you might as well go for shoes that dry quickly. Bring new shoes with good cushioning or you will pound your feet on the road walks. 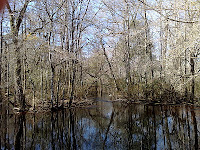 Trekking poles: You definitely need them for wading in the swamps - don't go without them. Maps and guidebooks: The FTA sells great maps and a data book for the whole trail. The maps are even waterproof and almost error-free. The data book has more errors but is still pretty good. The price is reasonable and the set is a very good value. Don't go without them, although the blazing is good. You will definitely need Sandra Friend's Companion guide. Although it has not been updated for 3 years, it still provides invaluable information. I would have starved without it. I carried all three (maps, data book and companion guide) for the whole trail. Rip out the pages for the corridors you will not hike and the weight becomes bearable from the start. GPS: I carried one, but did not need it. Blazing is generally very good, except in areas with recent prescribed burns. Just pay attention and you will manage. Permits: Reading the FTA website you will get the impression that dealing with all the permits you need is a nightmare. It sounds really bad, but is not much of a hassle really. I do recommend to get all the paperwork, but I was never ever checked a single time on the whole thruhike for any permit. There are just 3 things you really have to do: Become a FTA member and apply for the Seminole permit. You do both before you start. 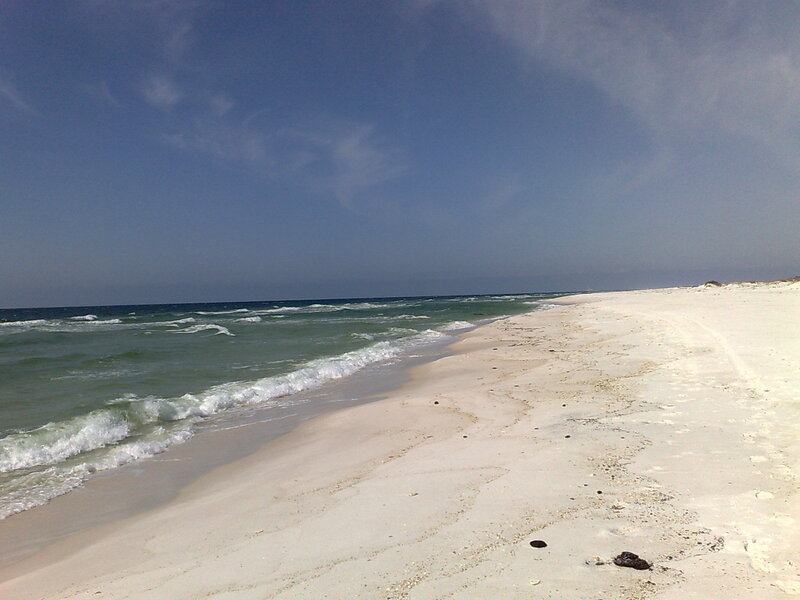 Halfway through your hike you request your thruhiker letter for Eglin and have it send to a post office. That's it! If you hike through St. Marks you can get your permit at the Visitor Center (which is only a short detour). As a normal thruhiker, you will not need any other camping permit. Shuttles from the Northern Terminus: The bus listed in the companion guide will only run after May 15th. I did not check out the water taxi, but you can get a normal taxi. It will not be cheap, but doable. Info for thruhikers: There are very few info sources for thruhikers: ft-l is almost dead - hardly any traffic and not much info. 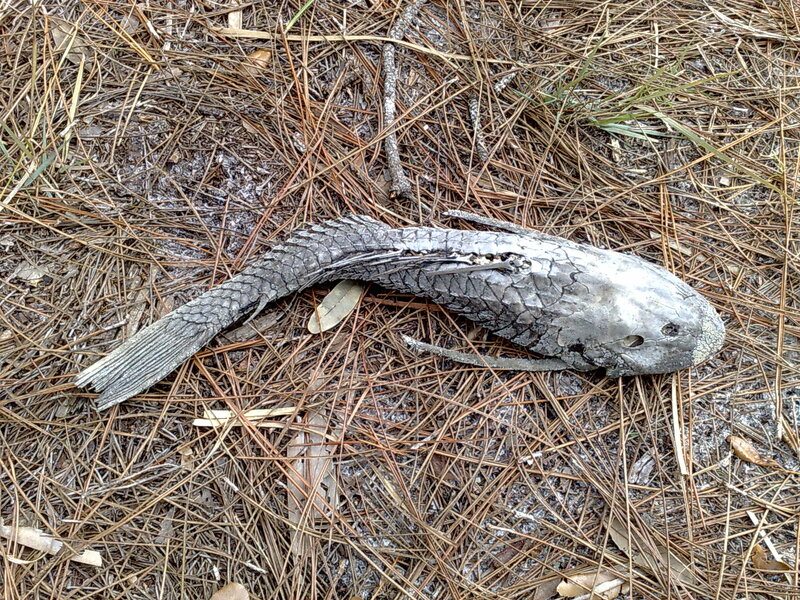 The Florida Trail room on Trailforums.com is equally dead. The FTA is not geared for thruhikers. Although the staff is friendly, you will not get much help with thruhiker issues there - unfortunately. I found this a very unique situation, as all other trail organisations I have been dealing with have been very efficient and helpful for thruhikers - not the FTA though. 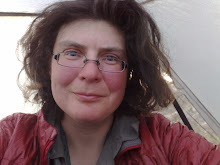 If you have questions or need help, you have to contact the local section leaders (you will get their names and contact info from FTA with your thruhiker package). Every section leader I contacted has been extremely knowledgable, friendly and forthcoming. I owe a lot of thanks to these people. 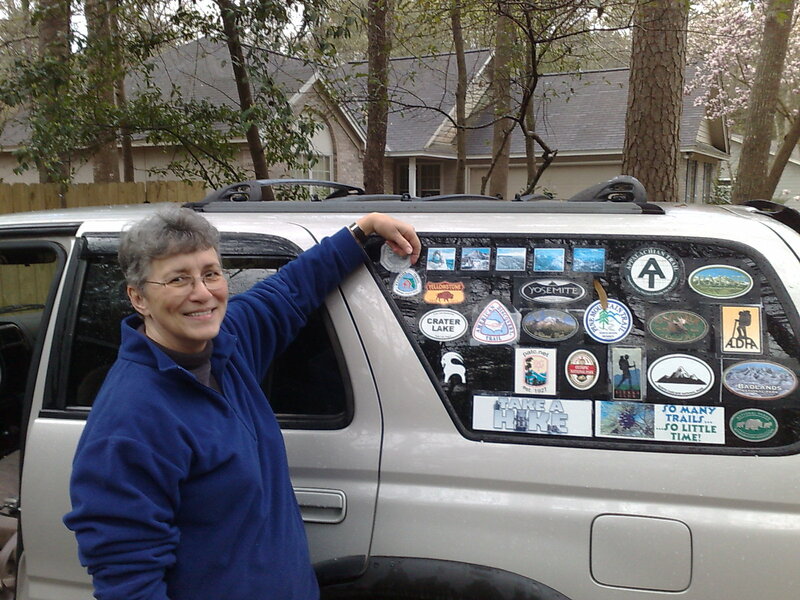 Trail angels: You will get a trail angel list with your thruhiker package. 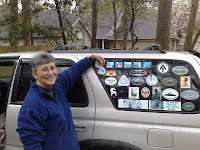 I stayed with 3 official trail angels and was recommend on to 2 "unofficial" trail angels. I had a wonderful time with each one of them. These trail angels are a great asset of the FT. But keep in mind that all the trail angels are clustered in the Orlando or Tallahassee area and there are hardly any trail angels in between. Resupply: Resupply can be challenging despite the fact that Florida is a very populated state. I did not send any resupply packages and did not hitchhike into trail towns, which made life a bit harder for me. There is not a single outfitter directly on the trail that sells gas cannisters. You rely on trail angels to shuttle you to outfitters for that. Plan accordingly or eat cold... In smaller towns grocery stores have a very limited selection. 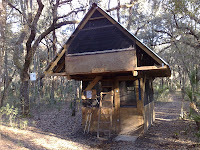 The trail town services do not cater for hikers or any type of outdoor people except hunters and fishermen. Most favorite quote: "It is always warm and dry in Florida winter." I would be strangled be an escaped Burmese python in the Everglades. I would be shot by a redneck. I would be hit by a car because they cannot drive in Florida. Well, none of the above happened. 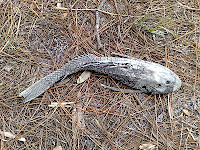 All the Burmese pythons have probably died in the record cold this year, the rednecks were pretty nice to me and they do not drive better or worse in Florida than they do anywhere else in the US. you hate to hike in wet shoes. 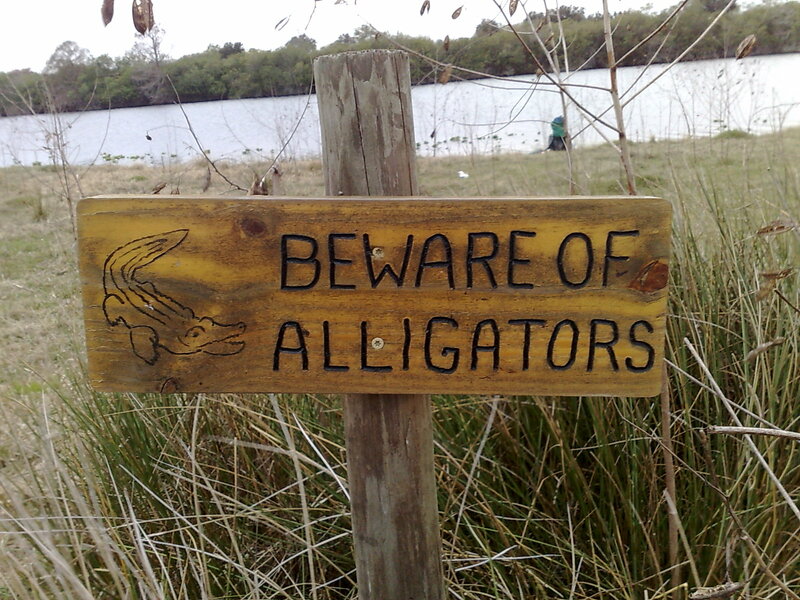 you are mortally afraid of alligators. you do not want to be called "Honey" and "Sweetie" in restaurants. 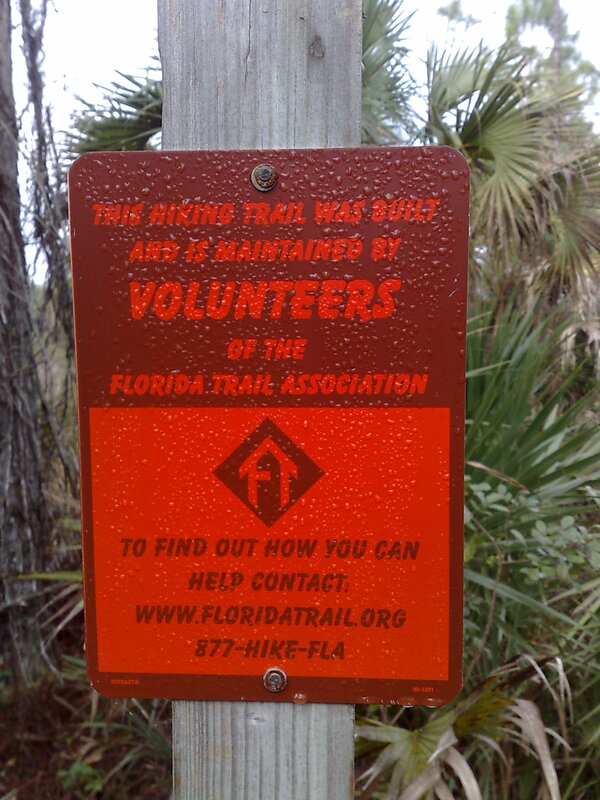 But seriously now: I personally had a great time on the Florida Trail - despite all the bad weather. I enjoyed the hike, but I cannot unconditionally recommend it. 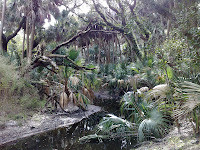 There is only one big drawback on the Florida Trail - it is only one, but it is grave: There are still too many road walks. 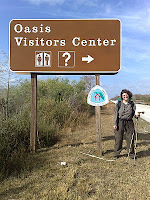 I did not count them, but according the official FTA website there are 300 miles of road walk on the 1,100 mile long FT - and that spoils a lot of fun. The road walks not only pound your feet, they also pose a logistical problem: Where do you camp along a 30 mile road walk? You are more or less forced to trespass - close to a noisy road. 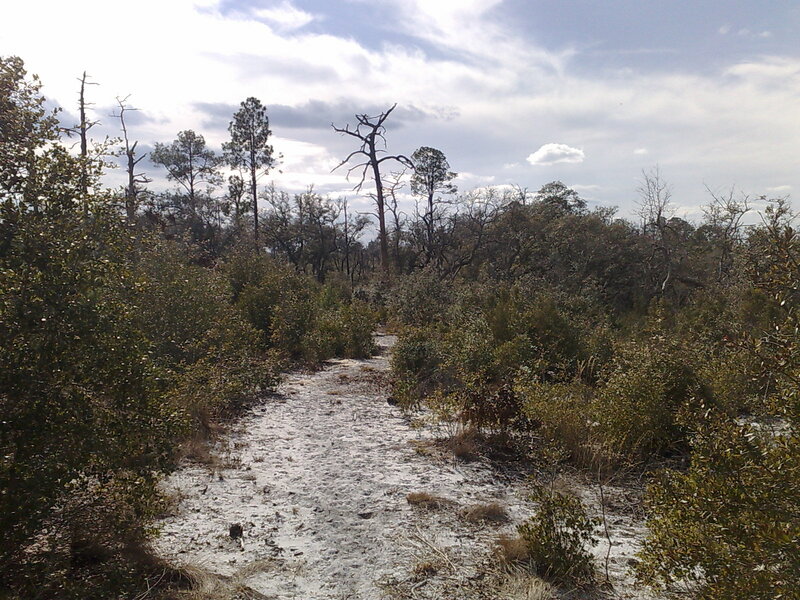 Therefore I would recommend hiking the Florida Trail in 5 to 10 years, when it will eventually be finished and the road walks eliminated. I have never seen that much wild life on a trail. I saw black bears, alligators, snakes, armadillos, otters, beavers, deer, turtles and tons of birds. The FT has some incredible trail angels. I had wonderful rest days and met the most interesting trail volunteers - thanks so much to all of them. And even the section leaders I had just contacted by phone or mail were incredibly friendly and forthcoming. The blazing and trail maps great - I had brought a GPS but did not really need it. The trail maintainers are doing a great job here. Bottom line: The FT is flat - but it is definitely not boring. If you are seeking an adventure, go for it (but wait a couple of years if you hate road walks...). And a big thank you to all the trail volunteers who maintain this great trail. And for all the hikers: I will post another comment with more specific recommendations on gear and logistics. Florida Trail - I did it! I left Crestview in very good spirits after a very relaxing rest day with my couch surfing host Mark. I had spent a whole day (8 hours straight!) at Mark's computer organizing the next leg of my trip (Arizona Trail), getting updated on emails and even paying taxes in Germany. Thank God for the internet! Mark works for the Forest Service so he could give me a lot of information as well. I had a great stay - thank you, Mark! I had 3 1/2 days left on the Florida Trail - piece of cake really. Only the last stretch posed some logistical challenge. 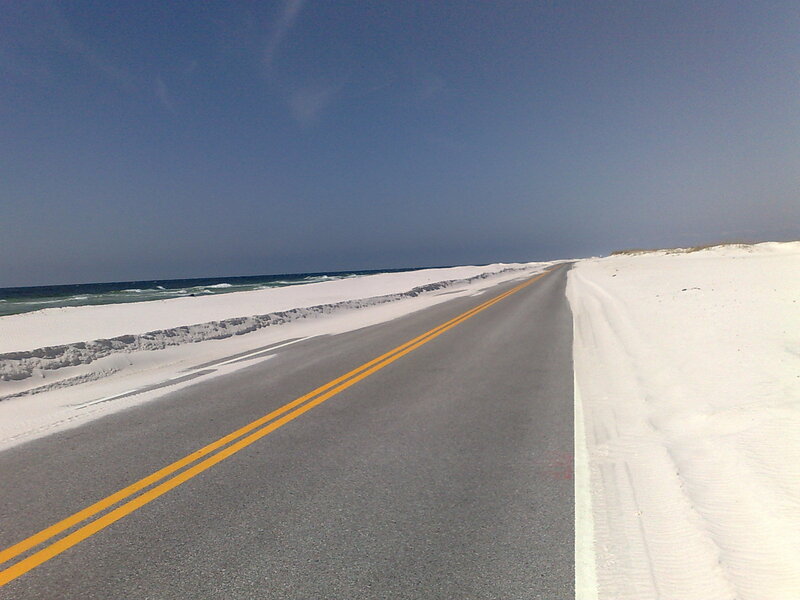 The FT ends on Santa Rosa Island, a barrier island south of Pensacola with beautiful white beaches and incredible views. 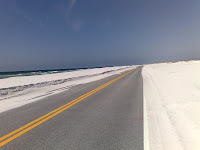 The down side of this is that there are no camping possibilities for 37 miles - it is either protected National Seashore or expensive beach motels. Other hikers had already complained about that. I did not want to spend a fortune on a motel and I did not want to stealth camp in the dunes either, especially since I have a non-freestanding tent that would be impossible to pitch in the sand. So I came up with what I thought was an incredibly clever idea. 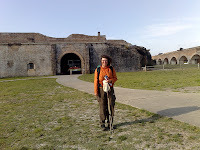 I would hike as far as I could and then take a taxi to the end of the island (and the FT) to Fort Pickens, where there is a state campground and hike back the next day. I had hoped to find a quiet corner somewhere at the campground but it was absolutely packed. Luckily this was not a problem. 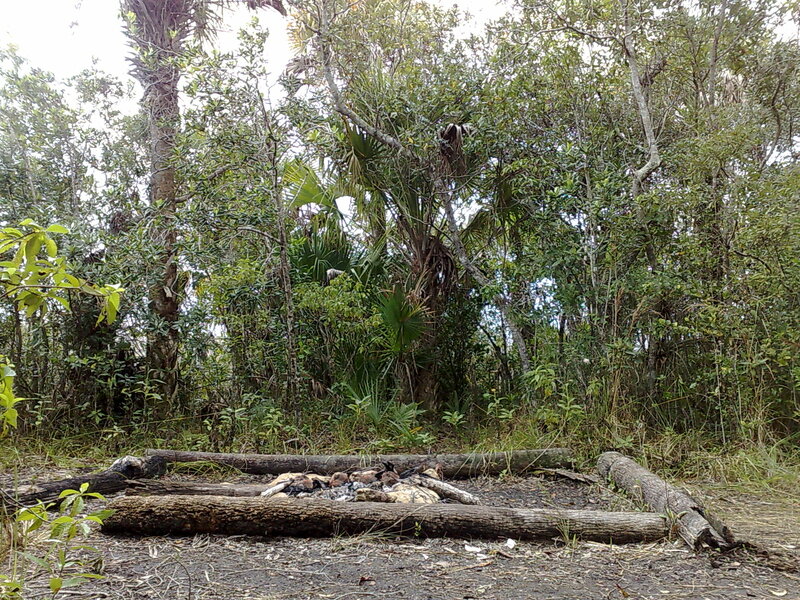 This end of the island was wooded so I just hiked on a bit and found a spot in the forest to pitch my tent for free. I guess I was not exactly legal there, but considering the wind that came up that night I was extremely happy to be sheltered among trees. Early next morning I went to the Northern Terminus and visited historical Fort Pickens where I was totally alone - no one there to take my finishing picture either! I hiked the 10 miles back I had missed the day before frolicking at the beach - as much as you can frolick in strong winds and ice cold water - but it was a pretty beach. 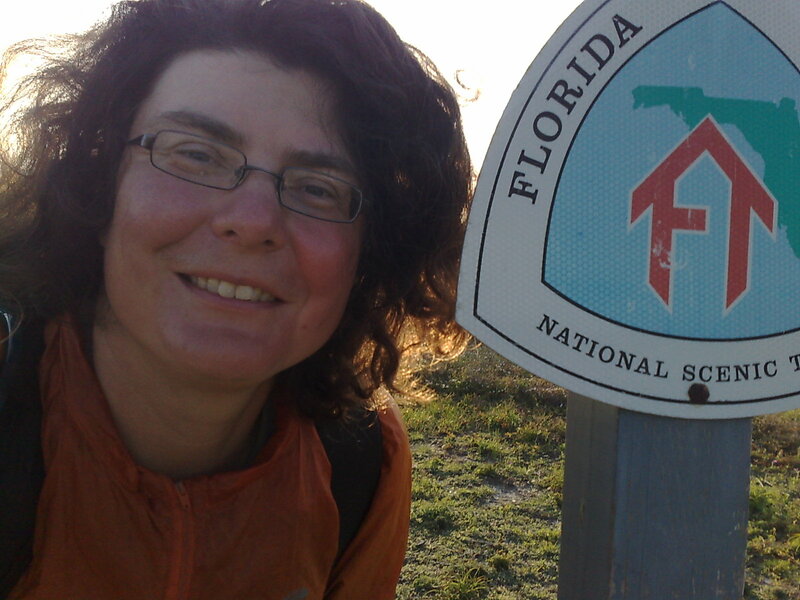 And then I had even officially finished the Florida Trail! The first German to ever hike it!!!! Horray!!!! Telling by trail journals I am the only one to do a straight thruhike that year so far. Other hikers did the whole trail, but due to flooding they had to flipflop some sections. At Pensacola Beach I was picked up and stayed for two nights with Tom and Anne in Pensacola in the most beautiful house with a sea view to die for. 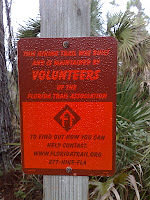 Tom is a the section leader for the Florida Trail and I learned a lot about the trail, its background and maintenance. I was spoilt rotten with great food, interesting conversations and 5 paperback books that will be my reading material for the Arizona Trail. What a great end for an adventure hike thanks to Tom and Anne! So today I will fly to Phoenix, AZ and start the Arizona Trail on April 1st. I have already received an email telling me that there is still thigh deep snow on the trail due to the El nino year....Aren't I lucky? I am in Crestview now and having a last rest day. 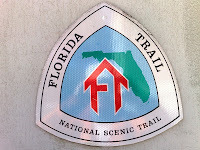 Only 3.5 more days and then I will be the first German to ever thruhike the Florida Trail. Isn't that a claim to fame? The last days have been pretty uneventful. Lots of roadwalks, lots of pine plantations and now Eglin Airforce Base, the last military installation I will cross - legally!!! I have all the necessary papers and the right dates and the permit. I have become a model hiker! I have been meeting lots of other hikers recently - mostly day or section hikers, but also Popeye, another thruhiker who is doing a flipflop. The most interesting person was young guy I met in Eglin. He must be around 20, had a wooden stick as a trekking pole, carried his tent under his arm because it did not fit into his backpack anymore and had a can a bear spray attached to his belt. He did not look like an experienced long-distance hiker. He was from Canada ("I am carrying bear spray ALL the time - this is what we do in Canada.") 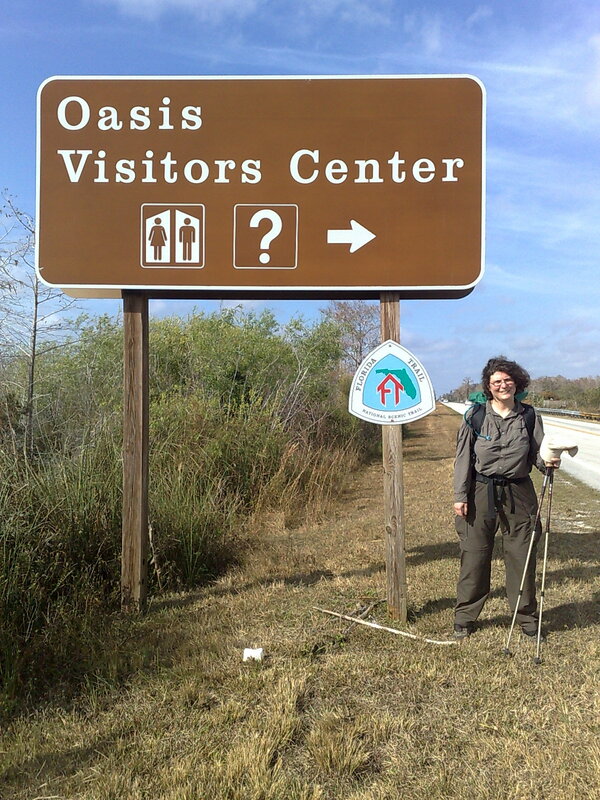 and had tried to hike the AT ("But I have very bad equipment so I got too cold on the AT and decided to hike Florida where it is warmer"). 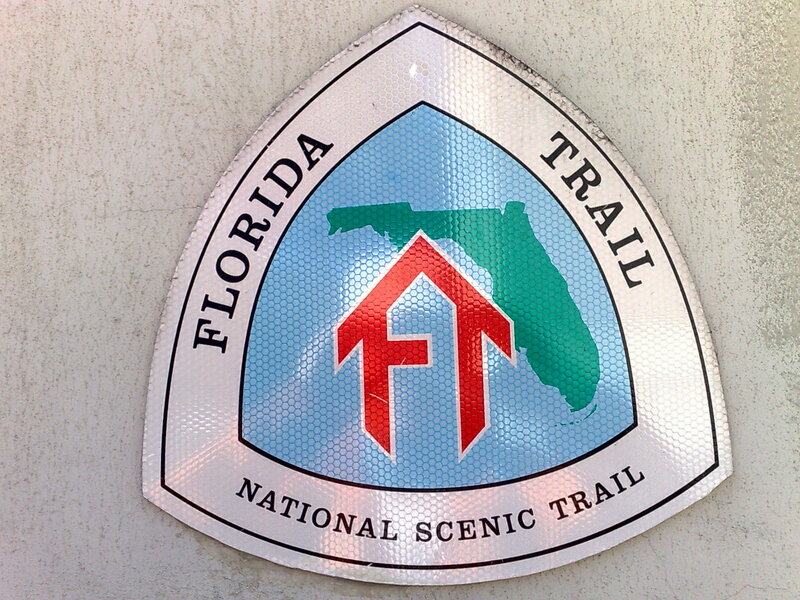 He intended to hike the whole FT with the Florida Trail overview map as his ONLY map - no detailed maps, no data book, no companion guide, not even a road atlas - nothing. I gave him my last section map and wished him good luck - he needs it. I have to admit that the river crossing they were talking about was the worst on the FT. Other hikers had warned me already of Alaqua Creek talking about chest high water. Maybe it is because I am 6 ft tall or the water levels have receded - it was only waist high when I came through. 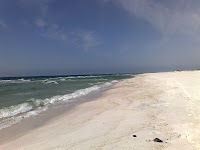 Still bad enough with a good current, but the ground was sandy. The water just reached the bottom of my backpack and I made it to the other side walking - not swimming. Right now I am at my last town stop in Crestview enjoying a novelty for me. There are no trail angels in Crestview and so I decided to give couchsurfing.com a try. And I was lucking - 2 possible hosts in Crestview. I contacted one trying to explain about the Florida Trail and it turned out that he is working for the Forest Service and knew all about the Florida Trail. 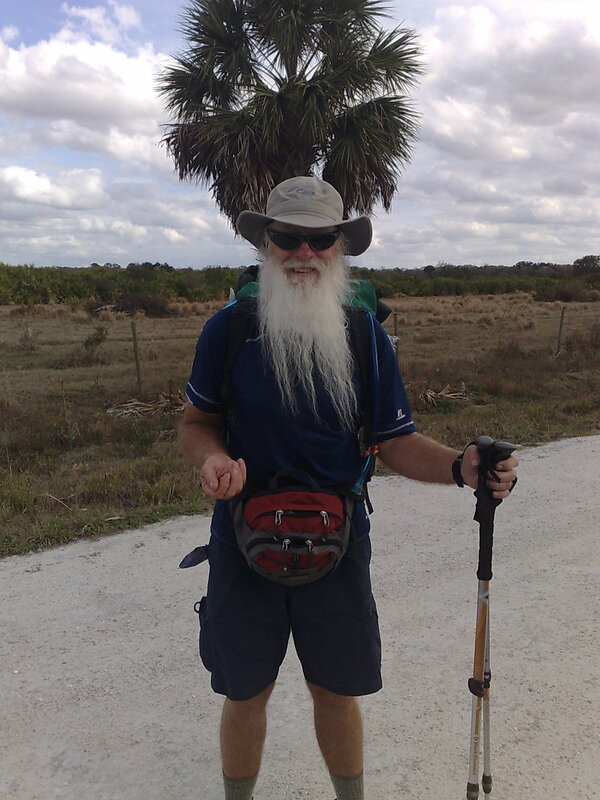 He is actually the first "non-hiker" I have met in Florida who had heard about this trail. So I am having a wonderful rest day today at my first couchsurfing host and will tackle the last stretch of FT tomorrow! I left the next day happy about my wonderful food supply, but very unhappy with the weather forecast that predicted three days of rain. The first day was not too bad at all: Just a sprinkle in the morning, when I was still in Linda's car and then sunshine for the rest of the day. But it was supposed to rain more that night so I tried to find a good campsite. 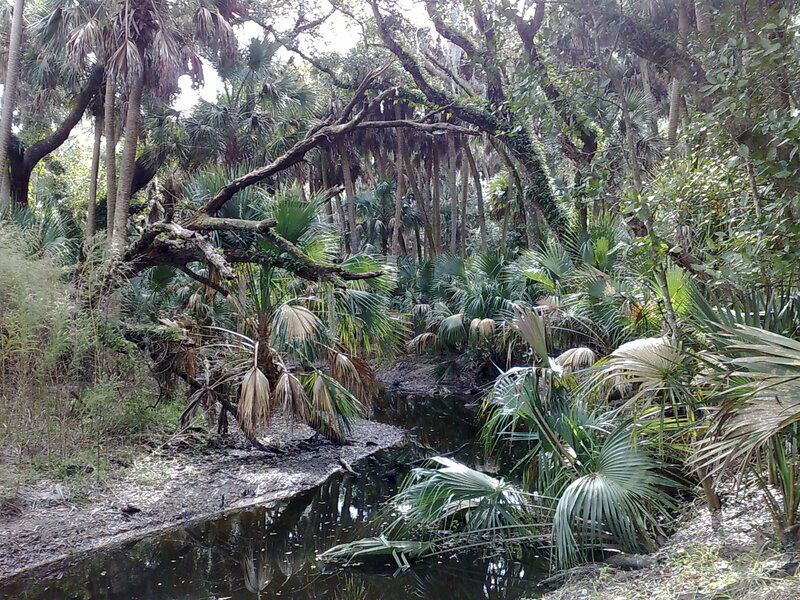 Unfortunately, I was still in St. Mark Wildlife Refuge, which is basically a swamp and you are only allowed to camp in designated camp sites. I choose a good "high" spot, secured the tent and expected a short downpour that night. It started to rain about midnight - and did not stop for 12 hours... I got up at 6.30 am and had breakfast when it was bucketing harder and harder. 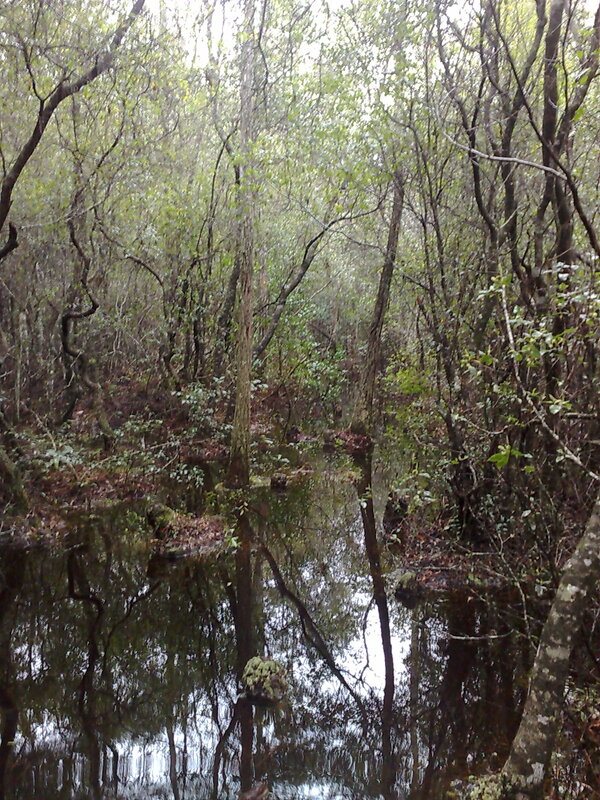 My good campsite was completely waterlogged and I felt like back in rainy season in Japan. At 8.30 am my tent collapsed. The ground had become so waterlogged, that a tent stake had come loose. I had no choice but to get out and fix it. Within one minute I was soaking wet and when I got back into the tent everything inside got wet in the process. At 8.40 the tent collapsed again, because the same tent stake had come loose. I realised that I could not stay much longer. I fixed the tent, packed and left during the next rain break. What had been trail the day before was now one big huge lake. 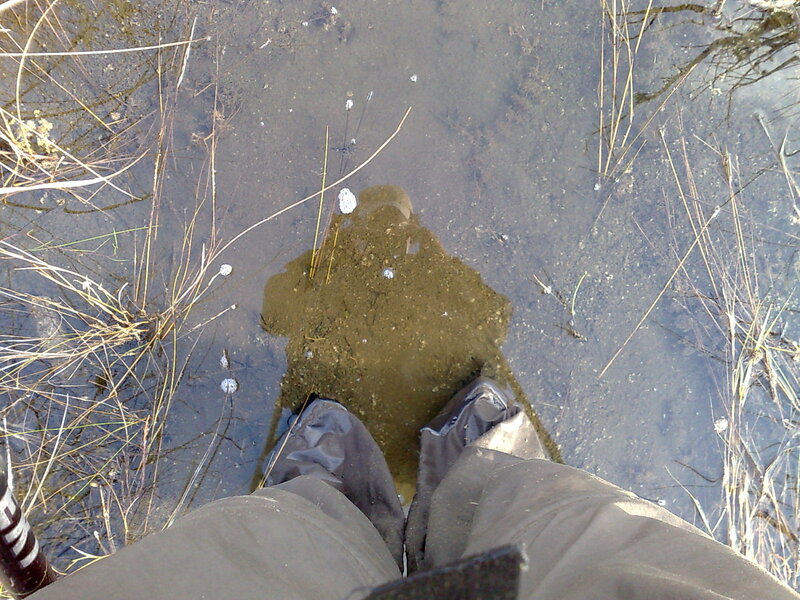 Everything was flooded and it took me forever to hike 1,5 miles to the next road. It was still bucketing down and I (who hates roadwalks) choose to walk on the road instead on trail. I was even planning to stay the night in a motel. This deluge was just too bad - and then it stopped. I decided to hike (or better wade) on and even found a dry campsite that night. 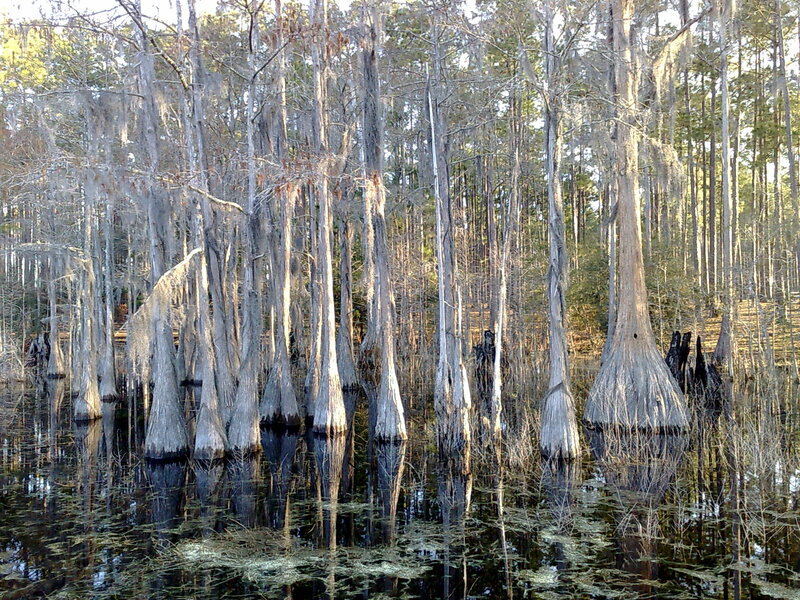 I thought that by now I would know everything about wading through swamps, but the Florida Trail is always good for a surprise. 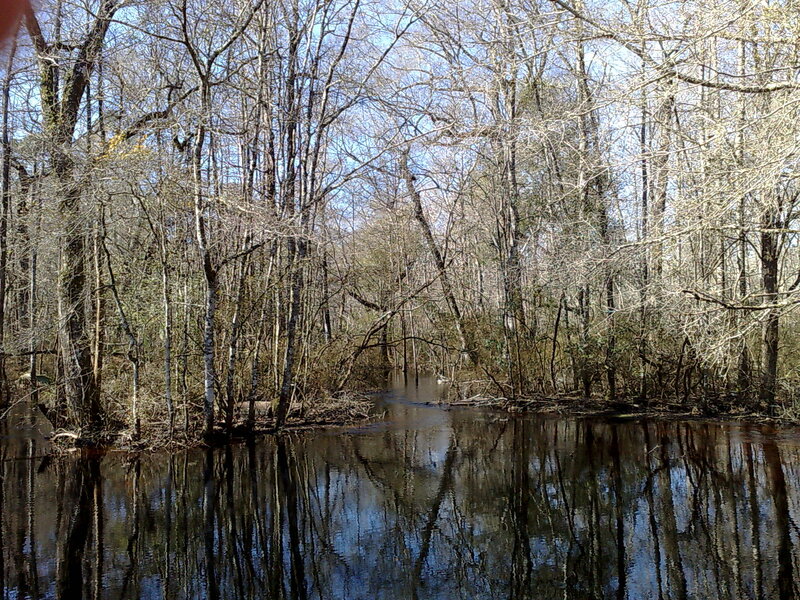 So what is swamp wading advanced level? When you hike on a forest road and it is totally inundated with chocolate colored water so you cannot see how deep it is. And when you get in it it gets waist high and has a strong current because one swamp empties itself into another swamp and you are right in the middle of it. How does that sound? I fell into a forest road.. 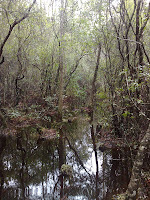 But the very worst had still to come: In the Apalachicola National Forest you either hike through burnt pine forest (not nice, but relatively easy hiking) or you have to cross swampy areas which means bushwacking through thigh deep water. 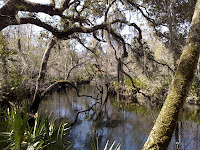 All this is bad enough doing for three days in a row, but one afternoon I came to a spot where the trail disappeared into water again - and there was an alligator lying there sunning itself. 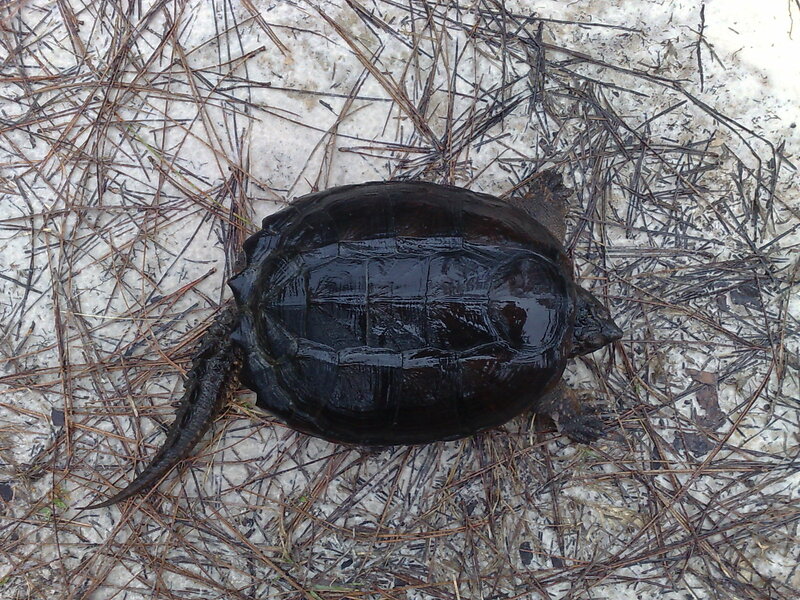 It disappeared into the water when I approached and I could see it swimming around the swamp THAT I HAD TO WADE THROUGH!!!! So what do I do now? 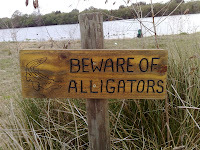 Alligators are usually shy, but you are not supposed to swim in water with them. What about wading through water with alligators? 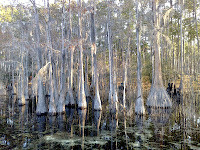 I tried to bushwhack around it but there was just more overgrown swamp and the last thing you want to do is get lost in a swamp. I decided to be brave and give it a try: I waded in making a lot of noise - and then realised that the water got almost waist deep and I could see nothing that was swimming around in it. I ran back to dry ground and thought some more. In the end I gave it a second try: Yelling and splashing a ran across waist deep water on tip toes - and made it! I am still in one piece and nothing is missing. 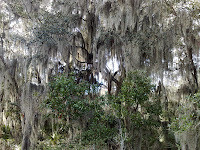 Now don't tell me that the Florida Trail is boring... it is full of variety because now I am facing a two day roadwalk! I was also very culturally deprived after hiking for almost 2 months - I had already been fishing old newspapers out of the trash can of St. Marks visitor center to have some reading material. Tallahassee was great for stocking up on culture: The next day I visited the Florida History Museum and an Art Gallery plus I bought 2 paper backs for 35 cents each at the local library. But the highlight of my stay in Tallahassee was another talk at the local chapter meeting: I had coincided again with their monthly meeting date and was honoured to talk about my thruhike as I had done in Orlando. In Orlando I had met Peter Dursnell, the FTA president, and in Tallahassee I met Deborah Stewart-Kent, the FTA executive director. I have never hiked a trail where I had met with so much "brass"! It was incredibly interesting to hear Deborah talk about their ideas for the Florida Trail and even be able to give her some input from the thruhiker perspective. 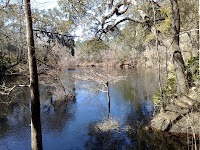 I really did not encounter a lot of problems along the Suwannee. I had to detour two spots which was relatively easy. 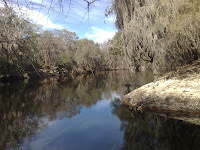 The Suwannee River was very beautiful and the nature experience was only spoilt by the fact that I was always very close to a noisy Interstate. I had just been very lucky. Had I started my hike early January as originally planned, I would never have been able to hike that section. All thruhikers before me had to roadwalk around this section, had given up or flipflopped. I had just had the right timing! Next came two uneventful days of hiking through tree farms that deepened my dislike of clear cuts tremendously, but hiking on forest roads is still 10 times better than hiking on pavement and therefore I will not complain. The Aucilla River was next and I did my now obligatory phone call to the section leader. The result was not very positive. 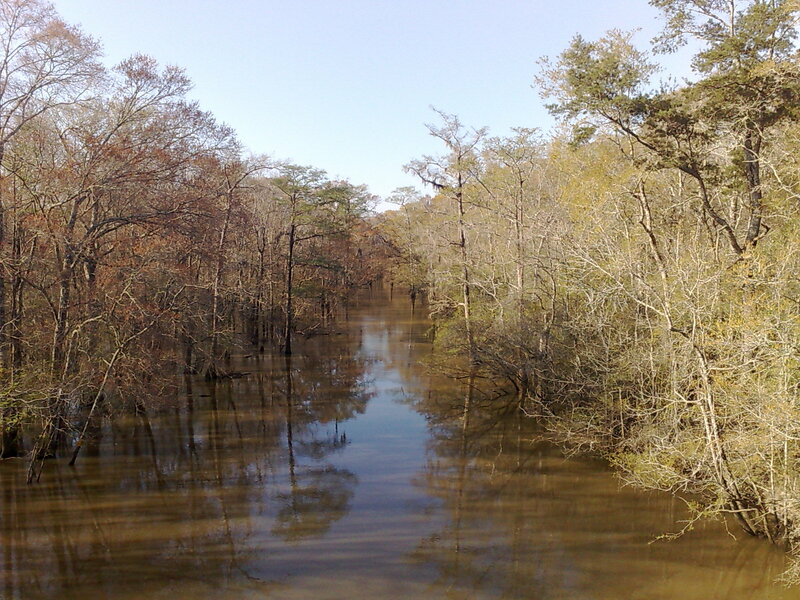 The Aucilla was still flooded but I should give it a try. I tried but did not get very far. After encountering the third ravine with waist deep water within one hour I decided to just detour around it on forest roads. This was the first time on the whole FT where I could really use my GPS! 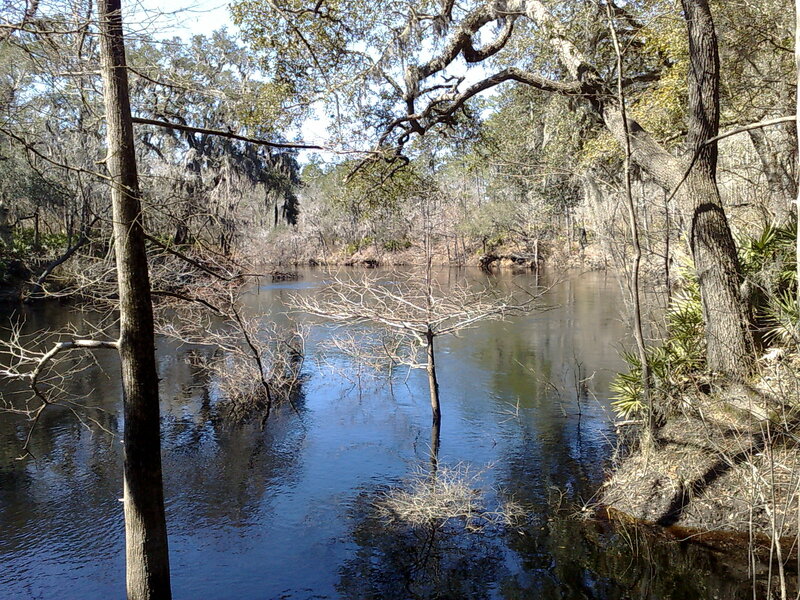 The Aucilla River (which is quite a big river) then suddenly disappears in big sinkholes and luckily that section was not flooded at all so I had an interesting walk there. 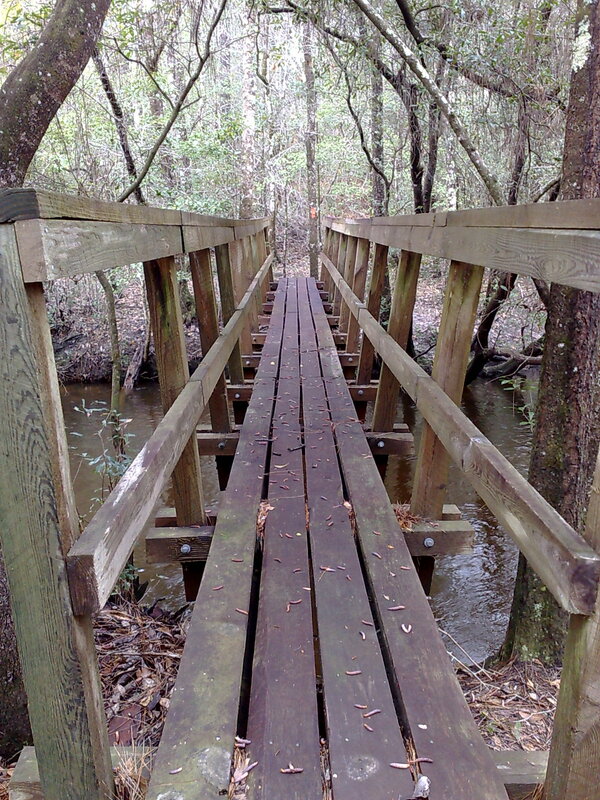 Now I only had to cross St. Marks River and then I would meet another trail angel and have a zero day! After more than a week in the cold with only Idahoan Mashed potatoes and Broccoli Cheddar I was really looking forward to that. The guidebook that you should just "hail a boat" to cross the river, but considering that I would be at the crossing early on a Monday morning I decided to make arrangements for a water taxi to pick me up at 8.30 am. Being very punctual I was at the river crossing already at 8 am patiently waiting for a boat. I was there at 8.30 am and unfortunately I was still there at 9.30 am because neither my shuttle nor any other boat had shown up! And of course I did not have cell phone reception either. I started to get really worried! I had an appointment with Linda to pick me up on the other side of the river and I had no means to contact her or the cross the river. Should I hike about 5 miles to the next bridge and cross there? Luckily at 9.30 am two unsuspecting fishermen showed up. I tried to explain my situation (which was really difficult with me standing on a little sandy beach and they about 100 meters away in a boat) and they agreed to get me across the river. I guess it helps to be a single female.... They had done their good deed of the day and I was on the right side of St. Marks River. Zero day - here I come! The weather being so cold and wet I had to be creative with camping and rest stops. How do you camp in this? 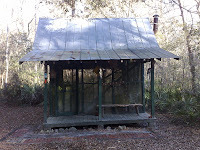 Next night record cold with predicted again and I was doing a 22 mile day to get to a private shelter on the Florida Trail: Madison Shelter. 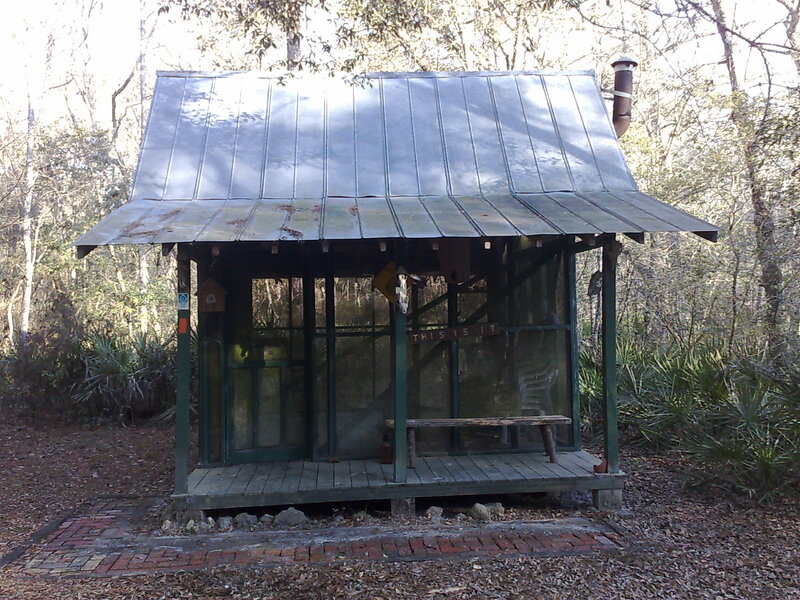 I should have read the guidebook better though: The shelter was very nice indeed, but it consisted of mosquito mesh walls and a roof only - and that does not keep you very warm in the cold! 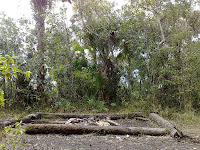 But it had a very nice stove and I learnt very quickly that dry palmetto leaves are a very good very starter, but rotten wood burns very badly. I was warm and toasty on the front and cold on my back, and once I went to sleep the fire went out after an hours or so and I was horribly cold. Big surprise: In the morning my socks and shoes were frozen so solid that it took me about half an hour to thaw the shoes out so I could get even into them. 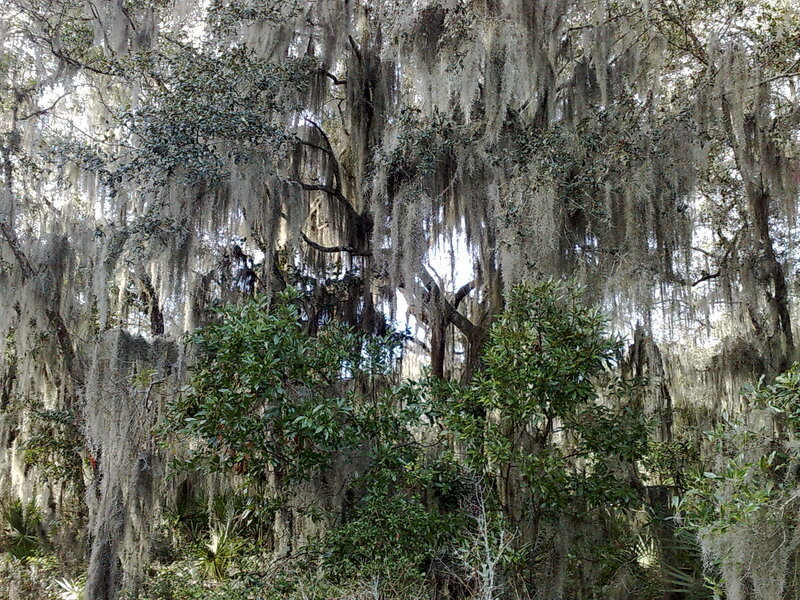 Bottom line: I needed a rest day and luckily White Springs was coming up. 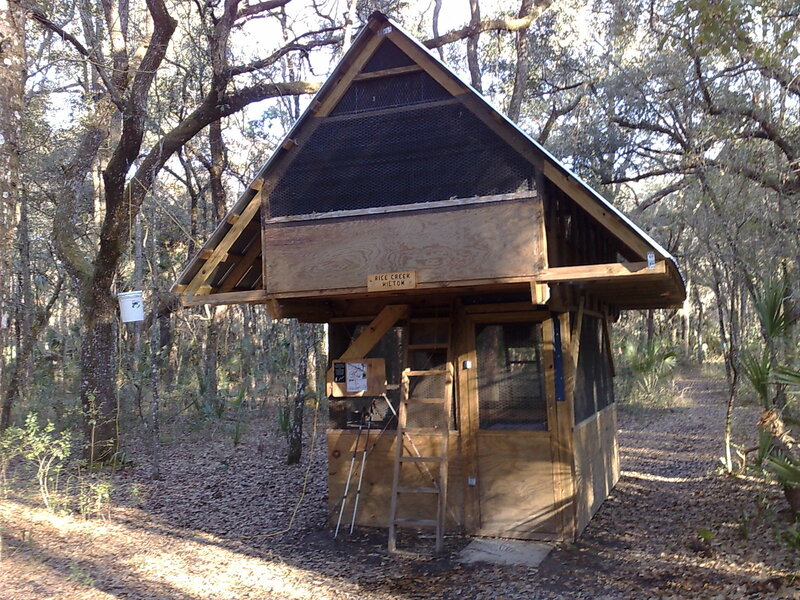 And I was very lucky to go to the Suwannee River campground first where I got a cabin with TWO electrical heaters and hot showers for 50 $. Not only did a get a 10% discount for hiking the FT, they also gave me free laundry soap and towels and on top of that there were free computers and a huge library. What more did I need for a rest day? Yes, an AYCE buffet, which was about 1 mile away in town and a great deal for 6.50 $. I had a wonderful rest day in White Springs, the only draw back being that I had to walk over 1 mile into town and that the resupply options consisted of a Dollar General and a tiny "Redneck store" with hardly any choice. To get to White Springs I had to hike across Osceola National Forest and this was the very first time I could complain about bad blazing. Osceola had suffered from a big forest fire some years ago and on top of that they had just recently had some prescribed burns (seems to be the topic of my FT hike....). Therefore most of the blazes had gone and not been replaced yet. 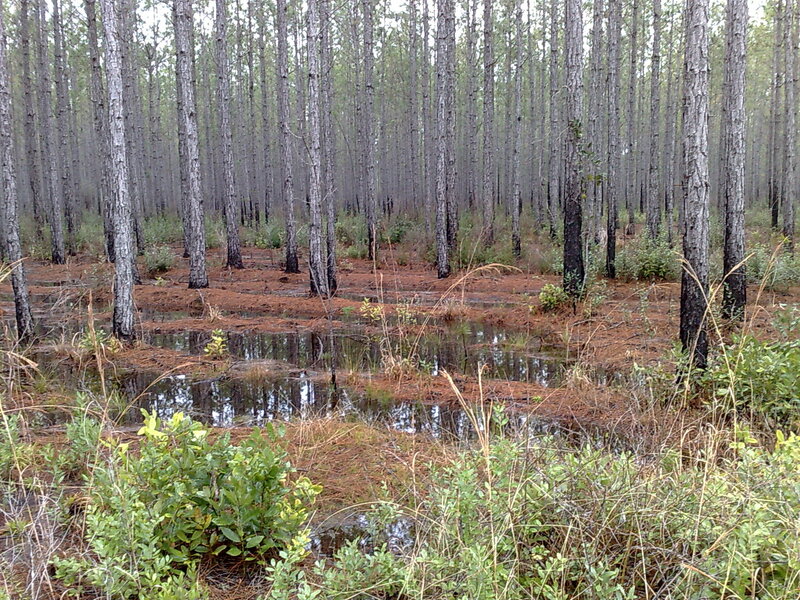 On top of all that half of the forest was badly flooded and so I ended up wading in knee-deep water scratching off soot from the trees to see whether there were traces of orange paint underneath. I have to brag a bit here and tell you that I never got lost once - it took me a while and some searching, but I did not get lost like the other two hikers I met in the forest. In White Springs I went to the Ranger Station to get some information on the upcoming section and had a hilarious encounter. 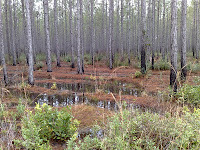 Some other tourist was there complaining about the bad conditions in Osceola National Forest. I told him that I had been hiking through that and thought I had not been that bad. "Oh no! ", he said. "If I had hiked through that I would have gotten my shoes wet!"